Hello! Well, we have survived the first two days of school here! It’s pretty quite in the afternoon with two kids out of the house and one that still naps. I have been busy getting things done that have been on my “to-do list” for months! 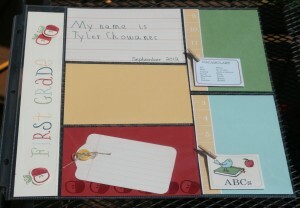 This fun scrapbook page was one that a friend and I designed for our August Scrapbook Class. We had a great time creating this page using the new 12 x 12 Divided Page Protectors (#127690). You get 10 different page protectors for $5.95. They come in a variety of styles and picture sizes. If you wanted you could simply add pictures to each pocket. You could jazz it up a bit like we did here with our page and add a Title pocket, a Journaling pocket, and places for pictures. There are so many great possibilities with these! I created my page here to add pictures of my oldest son on his first day of school. These Divided Page Protectors made it so easy! My favorite thing about this page is the little Journaling Pocket that I used to capture my Son’s handwriting. I gave it to him and asked him to write something about school. He had a hard time coming up with something, and he ended up writing his name. Either way, I love it! It captures him at that age perfectly! The Storybook Designer Series Paper also made this page come together so well. I love the little flash cards on the DSP and they made perfect accents on this page. Aren’t the little clothespins adorable as well! The Title was created using the Notable Alphabet (#126355 or #126357). This is a fun and whimsical alphabet! The apples are from the Perfectly Preserved Stamp set that is in the current Holiday Mini. I can’t wait to get his pictures printed out and added to the page! I hope that you can see what fun the Divided Page Protectors can be and how easy they are to use! Head on over to my store and grab some for yourself! I promise they make scrapbooking so much fun!